Before I begin my review of this book, I will disclose that I know the author Ben Sobieck. I have never met Ben, but I have corresponded with him through e-mails since April, 2012. Ben was kind enough at that time to publish one of my true crime stories on his e-zine Fingerprints. Since 2012, six more of my true crime short stories have appeared on that site. I don’t remember the date, but it was some time last year that I received an e-mail from Ben asking if he could use one of my short stories in this book. I told Ben I would be honored to have a story in his book, and an excerpt of that story appears in the “Imitating Hollywood Could Get Someone Killed” section of the book. The foreword to the book is written by David Morrell, the creator of Rambo. In the foreword, Mr. Morrell explains how he made a weapons mistake in a movie made from one of his books, and was criticized by two different combat schools in South Africa when the mistake was discovered in a Rambo movie. Ben Sobieck writes a fact filled book designed to help writers of crime fiction select the proper weapon for their character whether the character is a bad guy or a private eye on a caper. He points out the fact that Ian Fleming the creator of the James Bond character originally had 007 using a Beretta .25 caliber pistol in his book, but when the movie came out he was using a larger caliber pistol. It wasn’t as if Ian Fleming didn’t know a little bit about secret agent work, he was a secret operative himself in WW11. Fleming changed the pistol to a Walther PPK in .32 caliber when one of his readers wrote to him calling the Beretta a “ladies gun”. Ben knows the subject matter in this book. He is an online editor and product manager for several weapons and outdoors magazines as well as an author of crime and thriller books and short stories. He has also been a newspaper crime reporter. He points out some obvious mistakes made in movies and on television when it comes to handling weapons. There is a section on advantages and disadvantages of different types of weapons that may help a writer not to appear amateurish in their work. Ben’s book covers all types of firearms and knives. Everything from the Thompson sub-machine gun to homemade zip guns is in the firearms section and knives from the Cardsharp, a knife the size and shape of a credit card, to machetes. He writes about different types and sizes of ammunition and the book is full of photos of weapons and ammo. The reader will learn the difference between a sub-machine gun and a fully automatic machine gun. He also tells us the difference between caliber and gauge when it comes to ammo. This book is not one of those dry technical manuals that will put the reader to sleep. Ben uses humor when he introduces the reader to his “gal-damn” crime fighting private detective Maynard Soloman. Ben uses Maynard Soloman to show examples of good and not so good crime writing techniques using weapons. I would recommend this book to any writer of crime fiction that may need help in selecting weapons for their characters. You don’t really need to be a writer to use or read this book, it’s a good read. 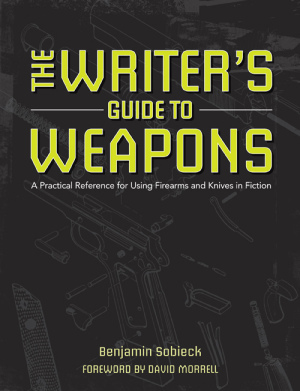 The weapons photos and descriptions are excellent, and Ben’s book is a good for people interested in knowing more about weapons, writing tips or how to contact Ben if you can’t find the weapon you are looking for to use in one of your stories. Based on action movies I have seen over the years, Hollywood screenwriters could definitely benefit from Ben’s knowledge of firearms and knives and his experience with these weapons.